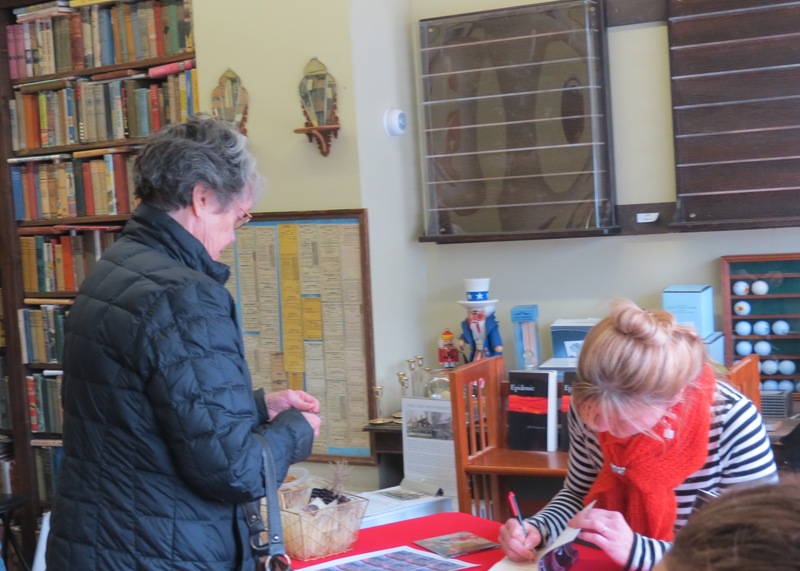 J.P. Choquette signs a book for a reader at a signing in early April. Ever have an experience like this? You hurriedly finish work just in time to scramble around in the kitchen making a quick dinner, inhale it while wondering if everything is packed in your “author bag/box/container” and then throw kisses over your shoulder to family as you roar away to the evening’s author event. Is all this rushing and stressing to set up and then attend author events really worth it? It depends. There is something magical about being able to interact with readers, particularly readers who enjoy your books. In a career where much of one’s time is spent interacting with a laptop more than people, making those real-life connections is refreshing and uplifting. It can push on a writer who has been dreading the next chapter to be written or edited, encourage the author who just received a harsh critique from another writer or spur one’s creative energy. It’s also a wonderful way to get to know what readers like and don’t like, new trends that are emerging in the literary world, and to be a help to would-be authors. Nothing is as fun as being asked writing/publishing questions, is it? And helping others on their way to finish that short story, novel or poem is a great feeling. On the other hand, there is a lot of time and effort involved in author events. Planning, organizing, promoting and then commuting to and attending the event itself–it can be a large chunk of time depending on the venue. Plus there is no guarantee that anyone will show up or if they do, that they will buy a book or even choose to read one of your books in the future. It’s probably more likely but certainly not guaranteed. So what’s an author to do? More entrepreneurial-minded authors might say something sensible like, “Well, take a look at the ROI,” (that’s Return on Investment, a business term I know because of the freelance work I do). “If it’s not making you X than let it go.” And then there are the creative souls who want to share their work with the world. We have, after all, spent weeks, months and sometimes years crafting this artwork. Why would we choose not to see people’s reactions to it in person? To interact with the very people we wrote the book for? But is our time better spent in focusing on our next writing project? Does it make sense to spend five hours on one event when that time could have been used to promote our book online or work on the next title? What do you think? How many author events do you choose to do each year and why do you choose to participate? What have been some drawbacks to attending author events? Any unexpected positive surprises? J.P. Choquette pens her Green Mountain Thrillers from northwestern Vermont where she also lives. In her free time she enjoys playing in the dirt, walking, reading and drinking hot sweetened beverages. . . but not all at the same time. This entry was posted in Book promotion, J.P. Choquette, Marketing, Writers and tagged author, event, platform, promotion, writing. Bookmark the permalink. All great questions. I attend pretty much any event I can drive to, and a few I buy a plane ticket to. I prefer events I am paid to attend, of course, or where I’m pretty sure I’ll sell some books. The least attended event I went to was last summer a few towns away. The library had publicized it well, as had I. As seven PM came and went and only one woman sat in front of the podium (NOT the librarian. Not even the librarian…), I pulled up a chair next to her. We had a lovely chat for about forty minutes and then she bought five books. So it paid for my gas, I made a strong personal connection, and I went home. No contact is ever wasted! I love events and will go where I can drive. If I worried about whether or not the event would pay for itself, I’d probably never go. Yes, it’s work, but to me it’s a lot of fun, even if only one person comes. I’m doing one this Saturday and I have one friend who is driving over from the coast (3 hr drive), spending the night in a hotel so she can attend. Even if she’s the only one there, I’ll give her my all. Thanks for weighing in, Marilyn. It sounds like you enjoy pairing work with fun–a drive to coast sounds great! Do you place any restrictions on your events other than within driving distance? And what do you find most rewarding from attending author events? J.P., this is a great post for thinking about (which is part of why it’s taken me so long to comment). My approximate rules: If it’s local, always say yes (and I do, with pleasure). If it’s more than 50 miles away, think hard about what the “return” will be, and don’t be afraid to ask for a different approach, like teaming up with an author “local” to that location, who’ll be able to bring in the readers. I’ve become a fan of team efforts! This sounds like a solid plan, Beth, and one that works well for you–I especially appreciate the mileage limit vs. looking at the potential return. It’s important, isn’t it, to do what fits in this situation? What works for one author might not work for another and vice-versa. Thanks for weighing in and sharing your thoughts!